“Using the physics equivalent of the strobe photography that captures every twitch of a cheetah in full sprint, researchers have used ultrafast spectroscopy to visualize electrons interacting as a hidden state of matter in a superconductive alloy. It takes intense, single-cycle pulses of photons – flashes – hitting the cooled alloy at terahertz speed – trillions of cycles per second – to switch on this hidden state of matter by modifying quantum interactions down at the atomic and subatomic levels. And then it takes a second terahertz light to trigger an ultrafast camera to take images of the state of matter that, when fully understood and tuned, could one day have implications for faster, heat-free, quantum computing, information storage and communication. The discovery of this new switching scheme and hidden quantum phase was full of conceptual and technical challenges. To find new, emergent electron states of matter beyond solids, liquids and gases, today’s condensed matter physicists can no longer fully rely on traditional, slow, thermodynamic tuning methods such as changing temperatures, pressures, chemical compositions or magnetic fields, said Jigang Wang, an Iowa State University professor of physics and astronomy and a faculty scientist at the U.S. Department of Energy’s Ames Laboratory. The new quantum switching scheme developed by the researchers (they call it terahertz light-quantum-tuning) uses short pulses of trillionths of a second at terahertz frequency to selectively bombard, without heating, superconducting niobium-tin, which at ultracold temperatures can conduct electricity without resistance. The flashes suddenly switch the model compound to a hidden state of matter. In most cases, exotic states of matter such as the one described in this research paper are unstable and short-lived. In this case, the state of matter is metastable, meaning it doesn’t decay to a stable state for an order of magnitude longer than other, more typical transient states of matter. The fast speed of the switch to a hidden quantum state likely has something to do with that. 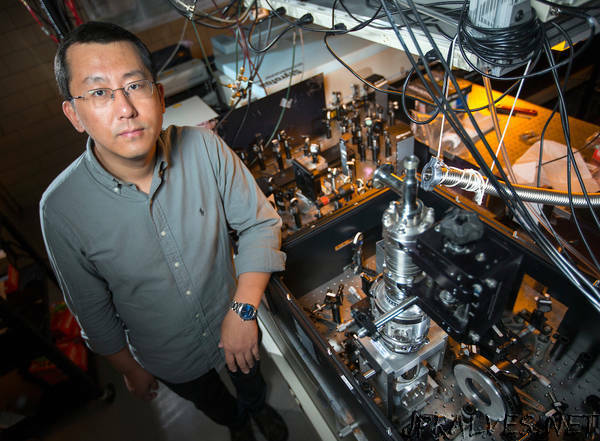 A remaining challenge for the researchers is to figure out how to control and further stabilize the hidden state and determine if it is suitable for quantum logic operations, Wang said. That could allow researchers to harness the hidden state for practical functions such as quantum computing and for fundamental tests of bizarre quantum mechanics. It all starts with the researchers’ discovery of a new quantum switching scheme that gives them access to new and hidden states of matter.